Straighten your teeth with clear, invisible braces! With Invisalign, you can get a stunning smile without most people even noticing you’re going through treatment. Invisalign is clearly the best choice for a better smile! A set of virtually invisible aligners that don’t interfere with your day-to-day life. 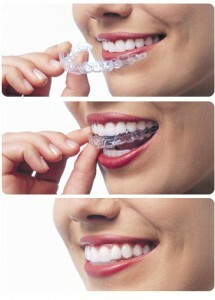 Your Invisalign clear braces treatment will consist of a series of aligners that you switch out about every two weeks. Each aligner is individually manufactured with exact calculations to gradually shift your teeth into place. And since your Invisalign invisible braces system is custom-made for your teeth and your teeth only, with a plan devised by you and Dr. Weinberg, you know you’ll end up with a smile that truly fits. Will Invisalign Clear Braces work for me? If you have problems with any of the following, Invisalign invisible braces can help. Not only is Invisalign versatile, helping to correct a broad range of dental and orthodontic issues, but it really works. And there are over half a million smiles to back that up. But a confident smile isn’t the only benefit of correcting your dental issues with custom-made Invisalign aligners—your health can be positively impacted as well. If it weren’t for the remarkable way it was transforming your smile, you’d hardly even notice your Invisalign clear braces because Invisalign braces let you live your life. In fact, they do an excellent job of giving you the flexibility you need, since they are clear and removable. After a consultation with us to discuss the goals you have for your smile, Dr Weinberg will write up a detailed treatment plan, and a set of virtually invisible aligners will be created based on that plan. Your Invisalign system may look like a simple piece of plastic, but it’s much more. With advanced technology, your Invisalign aligners are custom-made for you, and only you. Over time, your teeth should move to reveal the smile you’ve been looking for. Give us a call today to learn more about all of our cosmetic dentistry options available for our Juno Beach, Palm Beach Gardens, and Jupiter area patients!